Why We Should Abolish the Three-Strikes-Rule? How does the Korean Three-Strikes Rule Work? How Many Have Been Disconnected? Are the Postings Really Harmful? Why We Should Abolish the Three-Strikes Rule? In Korea, the copyright Three-Strikes-Out Rule came into effect on July 23, 2009 and gave the government a power to disconnect users from the Internet in the name of copyright protection. So far, although no one has been disconnected from the Internet, 408 website accounts have been shut down and 468,446 warnings or takedowns have been executed by the South Korean government (The Ministry of Culture and the Korean Copyright Commission, an entity empowered to do so without judicial scrutiny under the three-strikes rule). There is no prior judical scrutiny. The government has the full discretion in determining whether the postings or the user accounts are to be taken down or not. This is administrative censorship done fast and cheap for the rightholders, however, suppressing freedom of expression and communication and Internet users’ fundamental right to access, and endangering the future of the free and open Internet. How does the Korean Three-Strikes-Out Rule Work? There are two ways in which the users are cut off from Internet: by the Minister of Culture, Sports and Tourism (MCST); and by the Korea Copyright Commission (KCC). The KCC can make requests to online service providers: (1) to send a warning or (2) to delete or stop transmission of allegedly infringing material, or (3) suspend particular users’ accounts for a non-defined period. Surprisingly, there is no statutory requirement of prior three warnings for the suspension. From 2009 to 2012, the KCC issued the warnings as to 240,022 users’ accounts, the requests to delete or stop transmission of allegedly infringing materials as to 226,840 users’ accounts, and the requests for account shut-down as to 380 users’ accounts. “User’s account” can mean both an Internet access account and a website account. Therefore, both KCC and MCST are empowered to disconnect one from the Internet completely but that power has been exercised yet. All the numbers above are for website users’ accounts. How Many Have Been Disciplined? So far, the MCS has disciplined 1,204 users’ accounts, and the KCC has disciplined 467,242 users’ accounts, in total 468,446 users’ have received the warnings or takedown notices. Among these, 408 users accounts have been suspended, while none of the electronic bulletin boards have been suspended for three and half years. 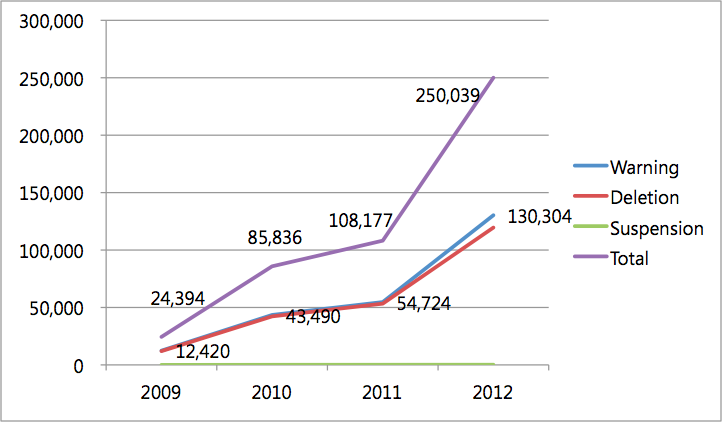 Notably the enforcement activity was doubled in 2012. According to the MCT, this was because reporting of illegal copies through COPY112, a website run by the KCC for piracy reporting (the number of reporting was 105,429 in 2012, while 15,549 in 2011). For the detailed analysis, click here. Some users have distributed huge number of unauthorized copies. But most of the users whose accounts have been suspended were minor offenders. In total, the number of infringing material by 380 users (who were disconnected by the KCC) was 11,140 (including 1,790 software and games, 2,748 audio and video, and 6,602 printed materials). However, almost a half of the materials was posted by two of them (5,404 (48.51%)). Those who distributed less than 10 materials for the whole period until they were disconnected were 132 (34.7%), while only 14 users (3.68%) have uploaded more than 100 materials. Further, most of the disconnected were not “heavy uploaders.” When the three-strike-out rule was enacted in 2009, the South Korean government insisted that the rule was necessary to regulate the “heavy uploaders” who have committed organized and professional infringement of copyright and gained huge illegal benefits. At that time, the South Korean government estimated that around one thousands heavy uploaders were working in webhard services. There is no clear definition of heavy uploaders, but according to the prosecutors office in 2012, the charged 372 heavy uploaders had distributed around 31,200,000 copyrighted materials (in average 83,870). Compare this average with 11,140 materials which have been distributed by all of the disconnected 380 users. Disconnection measures are not proportional to harm. 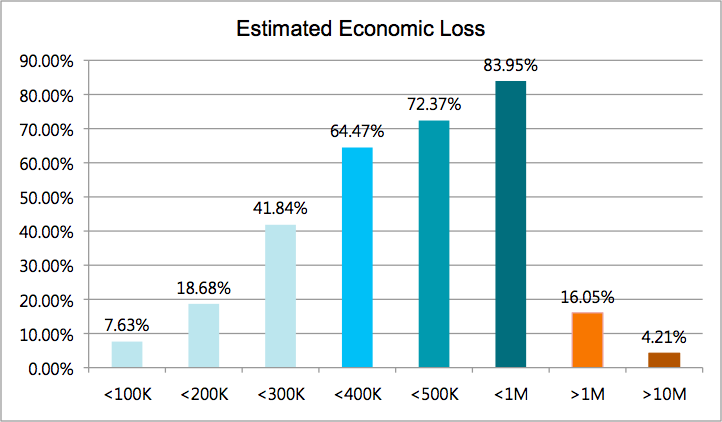 When the KCC considers the suspension of users’ account, they use their own methodology to estimate the economic harm (amount of infringement) of the illegal copies. According to this methodology, more than half users (64.47%) caused harm of less than KRW 400,000 (roughly USD 370), while only 4.21% users did damage of larger than KRW 10,000,000 (approximately USD 9,200). Show your support to the National Assembly Members who introduced a bill to repeal the Korean three-strikes-out rule.